My chest fridge conversion uses an average of only 8 watts, down from 100 watts (peak of 224), a 92 percent reduction of electricity use. The switch can be put in a wall box or a mobile box. The freezer is plugged into the box. 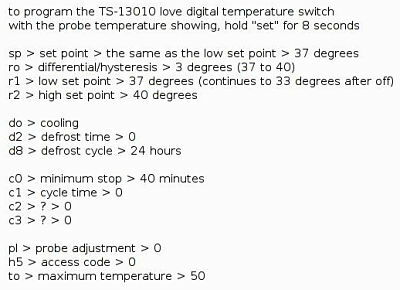 3) This is my TS-13010 programming to keep the temperature an average of 36 degrees. The switch turns on at 38, off at 36, and the temperature continues to 34 degrees. Having the probe attached to a container of water at the bottom of the fridge results in a smaller temperature range, and less compressor cycling. 4) Plug the chest freezer into the extension cord, and plug the other end into the wall (or plug the freezer into the switch in the wall). Verify that the chest fridge conversion is working as expected. Make any adjustments in programming. 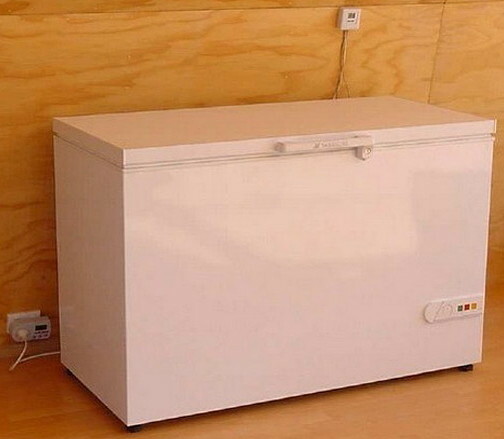 Move food from the old refrigerator to the new chest fridge conversion. The 7 cubic foot Whirlpool chest fridge averages only 8 watts ($.48 a month), compared to the old Frididaire fridge that averaged 100 watts ($6. a month). The chest fridge runs 5.8 minutes an hour, with an average temperature of 36 degrees (33 to 38). The fridge conversion uses only 8% of the energy that was used by the fridge. 1) Whirlpool 7 cubic foot eh070cfxcqoo Costco 200709 – Good, but no longer carried by Costco ($200 plus tax). Uses 80 watts when running (107* energy meter); 3 amps; runs 8.5% of the time as a fridge conversion (and 10.1% of the time when used as a freezer); is quiet and cool; does not put out any significant heat. 2) Six year old 5.4 cubic foot 1.5 amp Beverage Air 2sf-13 ice cream freezer, Craigslist $120. Good for the price. 3) 5 cubic foot chest freezer – $50 Craigslist, not tested yet. 4) GE 7cf fcm7suww – terrible ratings – Home Depot. 5) Frigidaire 7.2cf ffco723dw19 uses 121 watts when running, 5 amps; runs 33% of the time, is loud and gets extremely hot, heating the room. The freezer was returned to Costco. That’s so cool that you did that! Interesting conversion! Thanks! I’m trying to advise my son, a professional chef, on how he might use a chest freezer keep and deliver refrigerated (not frozen) food safely to catering jobs. One question: How and where is the temp sensor probe from the exterior Love control unit inserted into the freezer? lil 1/2 pint & Mike, thank you for your comments! The temp probe line is between the gaskets near one of the hinges in back. This is easier and safer than drilling a hole. The probe is duct taped 1/2 way down but not touching the back wall. So glad you found my one2flush post helpful! If you write a post about it you’ll have to let me know!! I am in the process of doing a similar conversion. I am considering sealing off the area surrounding the refrigerator compartment and ducting in cold air in the winter to reduce the load. I’m was also wondering if it would be possible to separate the compressor to release heat from the compressor into the interior space in the winter. This is a response to a “chest refrigerator” comment you left in 2010: In the winter, instead of ducting in cold air, would it be more efficient to redirect the hot air from the freezer? There is less load in the winter. I’ve raised the on/off range from 37-40 to 38-41, and it goes down to the same 33 degrees. Ducting in cold air would help, or put the conversion in the garage or a cold room for the winter. The fridge does not run much though, even in the summer. The compressor heat does go into the room regardless. The less it runs, the less heat that goes into the room. You could put foam insulation or radiant barrier foil inside the compresser compartment, which might keep some of the heat from getting into the fridge. Let me know how the conversion works out for you. I am very happy with this one! email me if you have more questions about building a pullover machine. I also converted my chest freezer to a fridge since I am off grid on solar. I have the freezer plugges into a timer, and it runs 1/2 at a time for 7 times per day and it stays around 40 degrees. I also put several 5 gal water jugs in the bottom for thermal mass to keep the temperature more constant when it is off. I’ll send you an email about your pullover machine. John do you have a link to that controller? If so could you email it to me as I am not on line much anymore, but get email by phone? My 2nd temperature controller is this 5amp 110v single device model from Ebay for $16.78 (shown here in a wall plate). 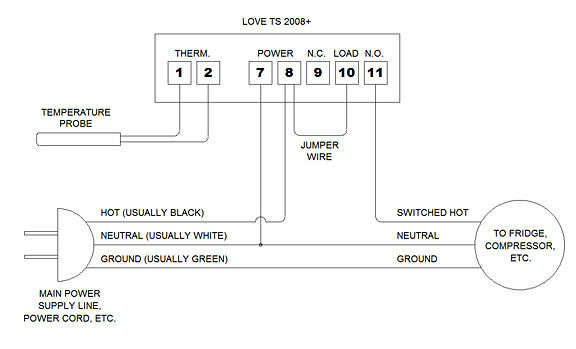 It is 1/4 the price of the Love TS-13010. Do you have to disable the thermostat that comes installed with the freezer? Also the instructions with the Love controller are very confusing to me, Is the R1 and R2 the only temps that need to be set? Brent, you do not need to disable the freezer thermostat, as any setting below freezing will work. I left it on the lowest setting. The new control takes over all the settings above that. Check the programming link above to see the programming that I use. I’m not sure what all the settings are but like the minimum stop to be 40 minutes. I like to use 2 to 3 degrees between the high and low temperatures, so the fridge runs the least often. Usually this is 39/36 or 38/36 and is a little different in winter than summer. The fridge cools the most efficiently in 6 minutes, then keeps cooling 2 to 3 more degrees after the switch is off. It helps to tape the probe to a small bottle of water, away from the walls, so the sensor doesn’t change as much when the freezer is opened. I got it done, I called Love controller and they explained the settings to me. SP is the temp to be concerned with, and the RO is the diff that will allow it to go above the set point before it kicks in. I used 37 deg so unit will kick on at 42, with an ro diff of 5. Since I will only use occasionally in primitive camp, and power with generator for now, I bought a 5 cf freezer , in the bottom i set, 4- 1 gallon milk jugs pre frozen with a sheet of plexiglass over top of them will help my thermal cooling at night without generator. I think it will work great, plan on using this weekend. Thanks for the help. Thanks a bunch for the wire diagram, made it easy, Love should use it for instructions. . I just got back and used the 5cf freezer converted to fridge. I put 2-1 gallon frozer water jubs in bottom portion and plexiglass on top to use as shelf, set the unit for 33 deg with a 6 deg diff and it worked great. I would power it twice a day with generator and it kept all very cool. when I would power back on, the temp would be in low 40’s. even after all night without power. worked great for my cabin in woods. next step will be to power with solar thanks for the info!! Brent, thanks for your feedback. I’m glad the chest freezer is working well for you too. I was having some trouble reprogramming the controller but figured it out, so am adding an amendment to the programming instructions. The chest fridge results in some water buildup from condensation on the bottom of the chest. I usually wipe this out once every few weeks with a sponge. It is not any problem, but is a concern that it might cause some rust in the chest. Some people use DampRid, that is just a silica gel, $4 for 42 ounces at Walmart. I got a package of this but haven’t used it. Keeping greens in a closed container solved the issue, as they were releasing a lot of water into the rest of the fridge. Thanks for this great idea. I plan to try it soon but have a question: The power company where I live changes generators every 12 hours so our power goes off twice a day for a while. Would I have to reset the temperature control each time? Thanks. You’re welcome. The temperature control keeps the settings when the power goes off, and then resumes as usual. You don’t need to reset them. The Dwyer controllers are $90 now, so I’m looking at Ebay controllers in the $20-30 range. can this be done with an upright freezer too? I can’t handle reaching down into a chest freezer. Yes, you can use a temperature control with an upright freezer or fridge. However this would not work well, because the cold goes out every time you open the door, and the temperature swings would be too great to maintain a reasonable temperature. Using a chest freezer or fridge is key in order to keep the cold inside where you want it to be. An excellent conversion. We have a glass freezer from an old bar we are looking to use as a fridge. We are interested in your project. I would like to know how your power consumption measurements were done. See my post about household electricity for measurement information. Still using the converted fridge in my primitive cabin, best thing I have put in there, “besides a flush toliet” with gravity flow water. It does work great, it uses very little current, the generator powers up just a second when compressor kicks in, then back to idle when it runs. I use a honda 2000. Will this work on a 19.7 Cubic Foot Chest Freezer? Yes, this will work with any size of chest freezer, though smaller chest freezers are more efficient. Thanks John I look forward to trying this out on my freezers. 8 watts avg is only 16ah draw/day at 12 volts- hard to believe when the novakool and frost king that are superinsulated chest-type rfg/freezer and smaller capacity are using in the neighborhood of 40ah/day – i would check your figures. Is it possible to splice the temperature switch off the wires going into the freezer lid and mount it internally? Yes, some people cut a hole in the lid and put the switch there, taking care to not cut the coils (which are usually in the sides). The switch does get warm, so my preference is to have it located away from the frame. Very much appreciate any guidance. I don’t have the wiring for the Ebay controller, but you can probably find it on this thread. Let me know the message # when you do, and I’ll post a direct link with instructions. The instructions for setup that come with it are not great but you can figure it out. The only thing it doesn’t say, is that when you are done with your settings, turn the controller off and back on. I am just getting started in making a freezer into a refrigerator and would like to know how reliable the controller from ebay is compared to the love controller and how long will they last. Thank you for posting wiring instructions for the Ebay controller. People on the homebrew forums report that it works fine for them. You will need a screwdriver. There is no soldering though. Yea, I bought a BRINKS $5.00 timer with 48 on/off settings ( 1/2 hour incremented ) at Wal-Mart. I set my chest freezer to run for 1/2 every 6 hours. I just keep soda and water in there. IT WORKS!!! 34 to 42 degrees. I bought two of the EBay controllers so far. I am converting a chest freezer that draws 100 watts when running so it is well within the contact rating of the controller. The two controllers have identical stock #’s (shipped directly from China of course) but one is rated at 5 amps and the other at 10 amps. The second controller is going to be used to control a hot plate in my smoker so I can accurately make smoked sausage. There are several steps in the process and this gives me good control of them. However, the hotplate will draw about 10 amps so I am planning to put a relay in a project box to handle the load and use the contacts on the controller for only a control circuit for the relay. There are sausage forums? Who knew? FYI: Some people think that this type of conversion would be too stressful on a regular scroll compressor, but I have chatted with a friend who is very good in the field of refrigeration and he stated that as long as the compressor is not forced to cycle-on inside of 2 minutes, there is no reason for concern. I’m going to do it simply to keep drinks in a mobile trailer for outdoor events, running off an inverter. Thanks for all the ideas! I just did a dirt cheap stand-up freezer to fridge conversion that is still working (so far anyway lol) using an old fridge’s thermostat instead of a digital thermostat controller. I haven’t had the best luck with 2nd hand fridges over the years. When I bought my house just outside a little rural town in Texas it came with a big workshop out back with a few fridges left behind by the previous owner (he supposedly repaired fridges & washer/dryers). They were pretty old & I burned through them fairly quick. Then I picked up a fairly new fridge & upright freezer from my parents when they remodeled their kitchen & pantry. Their fridge (along with it’s “Greenplug” energy saver plug-in doohickey thingie) was put into service & the freezer was put into storage in the workshop. The new fridge didn’t last long (after a little google-time I suspect the Greenplug might have killed it’s compressor). Then I got the freezer out of storage & put it into service on an outlet timer as a temp fix. The outlet timer wasn’t the best fix since this is an upright freezer. The best working temperature range I could get with adjusting the timer was about 27* to 55*. Just cold/warm enough to cause a growing condensation freeze/thaw cycle that left ice/water on every surface. Then after searching the web and learning about the freezer-to-fridge hack using a digital controller from ebay/amazon (while ideal, the wait for delivery of the components from ebay/amazon was too long) I began to wonder if any of my old dead fridge’s mechanical thermostats could be made to control the freezer. By shear luck both the freezer & fridge from my parents both had thermostats made by the same manufacture. Since I wanted to be able to switch the freezer back to a “freezer” in the future I decided not to remove the original freezer thermostat from it’s mounting point inside the unit. I just unplugged the wires from it, hung the used fridge thermostat from under the freezer thermostat mount, and then plugged the wires into the fridge thermostat. I straightened out the old fridge’s thermostat capillary tubing & hung the bulb from the back of one of the shelves. To my surprise the cobbled together freezer/fridge hack has worked pretty good with basically just swapping the wires over to the used mech. fridge thermostat instead of spending money on (and waiting for) a digital thermostat controller. Of course the mech. thermostat isn’t anywhere near as accurate as a digital controller would be. So far the current mech. fridge thermostat setting has had a stop/start range of around 34* to 45*, but it’s not 100% exactly the same every time since it’s a mech unit. Been using this freezer fridge for about 6 months. it’s a whole lot easier to buy a keg controller from ebay.http://www.ebay.com/itm/Temp-Control-Unit-Thermostat-Keg-Beer-Tap-Kegerator-/130767317151?pt=LH_DefaultDomain_0&hash=item1e7256e89f. just plug in to wall and plug freezer into controller and it will stay real close to that setting. works great. also like to dry bottom and spray with a 5% bleach in a spray bottle to keep possible mold or smells away. Also run this off of solar power very little demand compared to old standup frig. well i have a regular freezer and this frez/frig and a aquarium running all the time on solar, but i plugged in my kill a watt and the frez/frig showed 695 surge 120 running. so should be ok with a 1000 watt puresine inverter. then as far as panels and batteries would depend on how sunny of a place you have. you could start with one panel with a charge controller and a deep cycle battery and add panels and batteries as needed. I like dealing with wholesalesolar myself. Ok guys, I’m diving into the deep end and buying the whole thing, complete with solar. I’m kind of excited, because until now, the whole house has been run on propane (lights and heat). Is this an average of 8 watts per minute, per second or per hour? Or? If it’s 8 watts/hour, and only runs 5.8 minutes/hr, then the compressor draw — when it’s running — would be only 8 / (5.8/60) = 83 watts. This is hard to believe, unless it is an extremely small efficient unit. I don’t know what the voltage is but assume it’s 120VAC. If so, 3 amps * 120V = 360 watts, not 80. This electronic digital temperature controller adds a few watts of phantom load. Perhaps that is the 8 watts being drawn? 3 amps is the peak when the compressor first starts, not the average. 80 watts is the average when the compressor is running. As the compressor is running less than 1/10 of the time, the fridge uses less than 8 watts per hour. The temperature control uses very little energy, around 1 watt per hour, and is included in the 8 watts per hour. By the way, I measured this over 48 hours and during regular full use of the fridge. ok. thanks for the clarification. That makes sense. I also commented on the 8.5% (fridge) vs 10.1% (freezer) runtime of the Whirlpool 7 CF unit. This is only about a 15% difference. Comments? The Whirlpool 8.5% fridge vs 10.1% freezer runtime seems fine to me. The Frigidaire runtimes were 33% either way, which was quite absurd / disappointing. The average temp in the kitchen is probably around 70 degrees. John. Thank for your blog. I was about to buy a $60 home brew thermostat. David, thank you for your comment. As far as I know, that 110-120v controller looks fine. You might check this home brew link to get more expert opinions. Curious to know if this will maintain room temperature as well, somewhere in the 59-86*F range? Would there be condensation issues? Might a humidifier work? I’m looking to store a product at a set range, without having air conditioner or heat for building on weekends. The whirlpool doesn’t have a noticeable affect on room temperature. The frigidaire put out a lot of heat and affected it quite a bit, so this depends on the brand of freezer that’s used. Condensation is not much of an issue, but can result from greens and other vegetables giving off moisture on the inside of the cabinet. Storing them in containers helps. I usually wipe out the bottom of the cabinet every month or two, though doing this weekly would probably be good. Why would you use a humidifier? Thanks for the idea. I put together a similar system over the weekend and I have been testing its efficiency today. Hooked up the controller to a wall outlet in the garage, as pictured by John in this blog article. The controller cross section was a shade too big for the standard electrical faceplate. I had to do a little cutting of the faceplate to make it fit. Not a big deal. Besides, the controller is quite deep. It goes pretty much as deep as the “old work” deep electrical box. Again, not a big deal, but it took me about an hour longer to put all the electrical stuff together than it would have taken for a standard electrical outlet. I set the temperature probe inside a small plastic bag of water on the left side because the compressor is on the right side. The water bag hangs on the freezer basket, which is at about 75% of the height from the floor. I never opened the door during the tests. Thanks much for your detailed results. I’m glad it’s working well for you! Admiring the time and energy you put into your blog and in depth information you present. It’s great to come across a blog every once in a while that isn’t the same out of date rehashed information. Do these controllers come with zero crossing switching? Based on a quick search, modern switches appear to operate at zero crossings, so as to not generate interference. I’ve not noticed any issue with other electronics but, beyond that, don’t know. Thanks John. I wasn’t so concerned with interference as thinking of condenser life. I thought of adding a zero crossing switch to the AC condenser for the central air too, but the switches cost a lot and the HVAC techs think I’m from Mars for suggesting it, and I don’t know enough about HVAC to do it myself. I looked around some and found http://www.maxwell-fa.com/upload/20106123232962540.pdf but it doesn’t appear to be the inexpensive aquarium type, available cheap on Ebay. In case the temperature controls already have zero cross switching, perhaps check the specs or contact the businesses that make them. Your question is new to me, so please let me know what you find. Seems like a great idea. Does the temperature switch come with a temp sensor probe, or must the probe purchased separately? The temperature switch usually comes with a probe and, if so, this would be shown in the listing. Temp switches on ebay on Aug. 18 are for aquariums, which regulate in the vicinity of 50°F and warmer. Probably not suitable to control a refrigerator at 36°F. Do you have a part number or model number for a controller to operate in the low 30’s Fahrenheit? Check again, -50 degrees centigrade is -58 degrees fahrenheit. This is the one I use. I actually have two of them working. The internal relay is good for 10 amps but I use it to control an external 30 amp mechanical relay also from China for a pittance. Been working great for a year. Looks like something like this might do it. You can switch it with 120 vac and the relay function is zero crossing, so it would avoid spikes when turning the condenser on & off and make it last longer? They might know about the zero cross switch on this home brew forum. I know something about them, I worked as an electronics R&D technician for over 20 years. I don’t think I can beat the highly rated GE FCM7SUWW 7 cu ft freezer for $229 delivered, from Home Depot, if I use the controller to make a refrigerator out of it. All your hard work is going to a wordpress domain. Create your own domain name ($11 at name.com) and start using that. Get a host gator baby plan for shared hosting, then use chanel to install wordpress, then Google adsense for ad. Just one ad and out of way. Keep publishing tips like you are and money will start to come in. Can you imagine a scenario such as this working? A chest freezer left as a working freezer yet forming a insulated compartment in the freezer that would be used as a refrigerator by allowing some cold air into the insulated compartment for cooling. I have read that some freezers are much more efficient than refrigerators anyway. Then one has the chest style door factor. If one could use the correct type of insulation with a sufficient amount of air seepage from the freezer compartment into the refrigerator compartment to compensate for how often the chest door is opened to access the refrigerator section, while the freezer section has an interior door that would remain closed. Or does it make more sense to have a chest refrigerator and a separate freezer? Hi John: I found a 15 cu.ft. Whirlpool chest and was wonder if it is basically the same as the 7 cu.ft. model so that the same conversion would work on it. This conversion should work with any freezer, as the temperature control controls the temperature range. Thank you. The Whirlpool fridge conversion is still working great. Can anyone tell me if this would also work for a normal (small) refrigerator? I am on solar in a 5th wheeler, and would be interested to know if the same would work? Yes, this would work fine. Just adjust for the temperature range that you want. John, are you the same johnlvs2run that posted about an eMachines c2280 in … 2008? If so, I’m actually looking for that model for at least the casing. If that’s you, is it something you’d be willing to part with? I source low-consumption appliance options for people living off the grid. I found a chest refrigerator from France, but it’s $1100 and has too many extras that aren’t worth the money. Drawer refrigerators are similarly exorbitant. I’m really glad I found your article. Someone could make a cottage industry out of such conversions. Converting compact chest freezers would be great for RVs, campers and tiny homes — sounds like it could easily run on a battery with solar charge during the day and restricted access after sundown.